A boy who fled a village south of Mosul, Iraq, receives a measles vaccination from a UNICEF-supported government health worker at an aid distribution in Ibrahim Khalil. 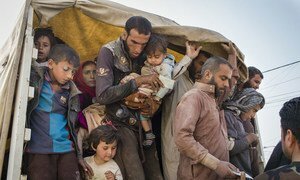 Some 20,700 people have been displaced since the operation to liberate the Iraqi city of Mosul from terrorists started on 17 October, the United Nations Children’s Fund (UNICEF) said today, estimating that 9,700 of them are children in urgent need of assistance. “I met mothers and children who were so relieved to have come out alive; it was clear that they had gone through so much,” said Pernille Ironside, UNICEF’s Chief of Field Operations in Iraq, following a visit to Nargizlia screening site. The Iraqi Government and its international partners are fighting to retake Mosul from the Islamic State of Iraq and the Levant (ISIL/Da’esh) while the UN agencies and its partners are stepping up humanitarian assistance for the displaced. Many of the new arrivals come in dusty, exhausted and uncertain about what is going to happen next. Some are even barefoot. UNICEF reaches out to the families, checking on the condition of their children and finding out if any of them are missing. “As the situation continues to unfold, it is important that we remain nimble and that we adapt our response to best assist children and families who have been through so much over these past years,” Ms. Ironside said. Upon arrival, families receive clean drinking water and snacks that include a nutritional supplement for children. Children 6 months to 15 years old are immediately immunized against polio and measles – many of them for the first time in two years – by a UNICEF-supported local government team. Families spend up to half a day in screening sites before being transferred to an emergency camp where they are assigned shelter. There, UNICEF ensures that water, showers and clean latrines are available. Children are screened for malnutrition, and treated accordingly, and UNICEF-supported mobile teams provide psychological care for children. UNICEF is also preparing temporary learning spaces and recreational activities for children in the camps. While many people have fled and are staying in camps, others have chosen to remain in their newly retaken villages. UNICEF is adapting its response to reach all populations in need. In October, UNICEF delivered bottled water and hygiene supplies for more than 1,500 families, and vaccinated children against polio in two newly retaken communities. Conditions for both displaced and local children and families in these communities are very poor, with families in desperate need of clean water and other essential supplies. With the military offensive still unfolding in Mosul, the Office of the United Nations High Commissioner for Refugees (UNHCR) and the UN Children's Fund (UNICEF) are rushing to provide shelter, drinking water, and sanitation services for displaced families and children.